Storytelling is one of the most important aspects of Lego-photography. Photos that are nothing more than beautiful will certainly attract your attention and you may be momentarily awed by them, yet, you probably won’t remember them very long. It’s the images that tell you a story, the ones that speak to you, that will linger in your mind for a much longer time. How does a single image tell stories? A (Lego-)photo is an image frozen in time. As such, it does not tell the viewer what happened before or what lies ahead. The art of storytelling with a single image involves persuading the viewers to create their own version of a past or future, based on the image you presented them with. In short; a (Lego-)photo doesn’t tell the story, the photo motivates the viewers to create their own personal, emotional stories! And since all people are different, these stories will differ, amongst other things depending on memories, personality and experience. This also explains why some pictures will tell an elaborate story to one person and are quiet to another. I cannot give you a straightforward recipe. I mean, storytelling through Lego-photograpy can be really hard. However, I can give you a few basic tips to increase the chances of your Lego-photo telling a story. First off, who or what is the hero in your image? Is it a person, animal or maybe even an inanimate object (for example an old abandoned car, or a lonely house on the hill)? Then ask yourself if your protagonist is interesting enough to make people wonder. Simply taking a picture of a tree or Lego-minifigure just won’t do it. You’ll have to provide the viewers with some context concerning your hero and ultimately take control of the entire frame. Thus, inviting viewers to (unconsciously) start thinking. For example, Figure 1 shows Willy the One-Eyed wizard. As you might know there is an elaborate backstory on him in the first Foolish Lego Comic, and an even more elaborate backstory in my mind. Yet, I wonder, what is your story for him when you see this image? 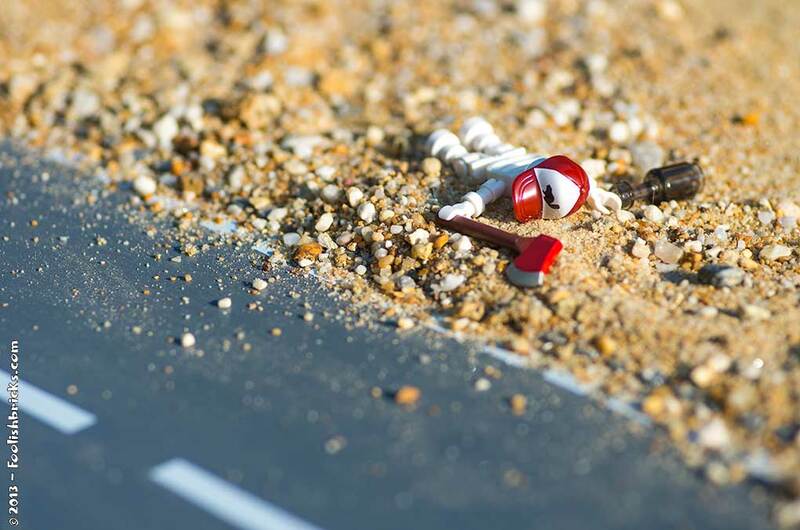 And maybe this Lego-photo fails to tell you a story at all, but, even that is interesting to think about! Why doesn’t it speak to you, what would you have done differently? Second, it may be a good idea to include details! These may be larger or smaller details. And sometimes even the smallest of details may just be enough to get the train of thoughts of the viewer rolling. And a story is born. Figure 2 shows the photo “Lonely”. There are quite a few details in there. For example, the ring and the closed umbrella even though he’s standing in the pouring rain. That alone could trigger a few (love?) stories. Another detail is that the protagonist is an elderly, so maybe he just became a widow? Besides, what is he doing street side, dressed up with a bow tie, but not caring about the rain? Enough to think about. There are quite a few stories in there as long as the Lego-photo is inviting enough to make people care to look at the image long enough to find the one stories that appeals to them. Third, storytelling through (Lego-)photography is all about emotions! And conveying emotion can be difficult with our little plastic friends, especially because not every facial expression is present in the Lego line-up. Also, body language can be a challenge. The first thing you need to do is to find a facial expression that fits your image or find a way to work around the facial expression. Take a look at figure 3; I wanted a loving face for the elderly lady, buy could not find one. Yet, by hiding the lady’s face, I myself create the loving face I wanted. On the other hand, other viewers might feel this guy has to make up for something while she is looking quite angry. Again, there are many stories in this one image. Also, you need to pay attention to the stance of the Lego-minifigures. That is the closest thing to body language they have. And if there is a stance that seems impossible; sticky tack could be the solution to many problems. Also remember to pay attention to the hands of Lego minifigures; you wouldn’t believe what a difference the rotation of the hands can make for conveying emotions. Lastly, do not forget the surroundings, lighting and especially color. These three elements can drastically change (or destroy!) 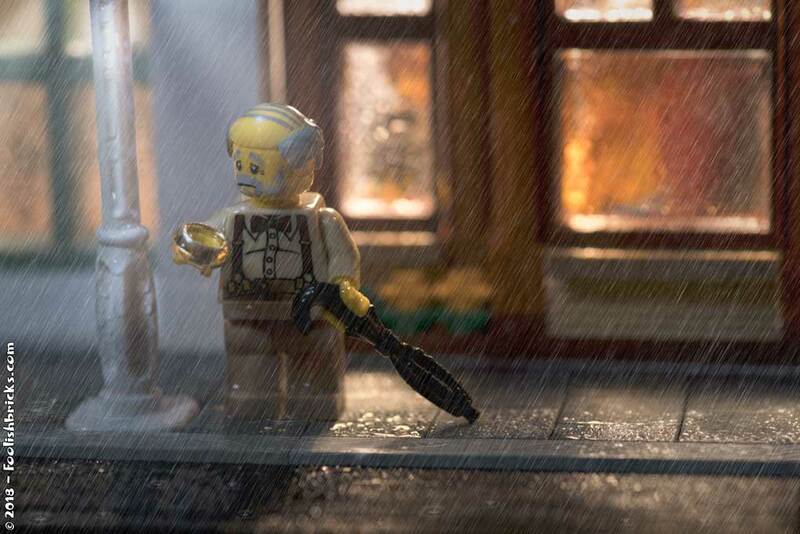 the emotion and thus the potential for storytelling by your (Lego-)photo. Fourth, if you’d like, you can add ambiguous or contrasting elements in your images. 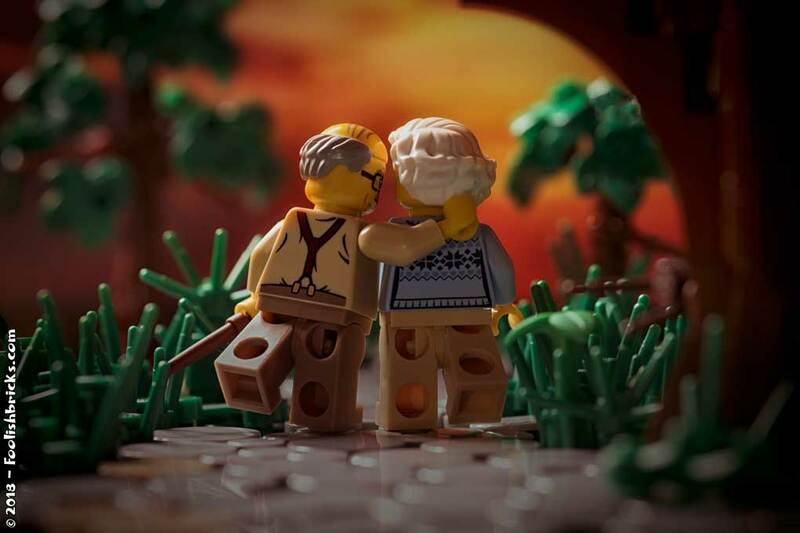 In general, there are three types of stories that can be told through (Lego-)photography; personal stories, documentaries and lastly ambiguous stories. Documentaries generally don’t benefit from ambiguous elements. Also, don’t use this tip if you are looking to tell a singular story. Figure 4 shows “lousy hitchhiker”. What happened here? And why is this person (M/ F?) carrying an axe in what looks to be a desert? Besides, why is (s)he still holding on to that axe, etc. 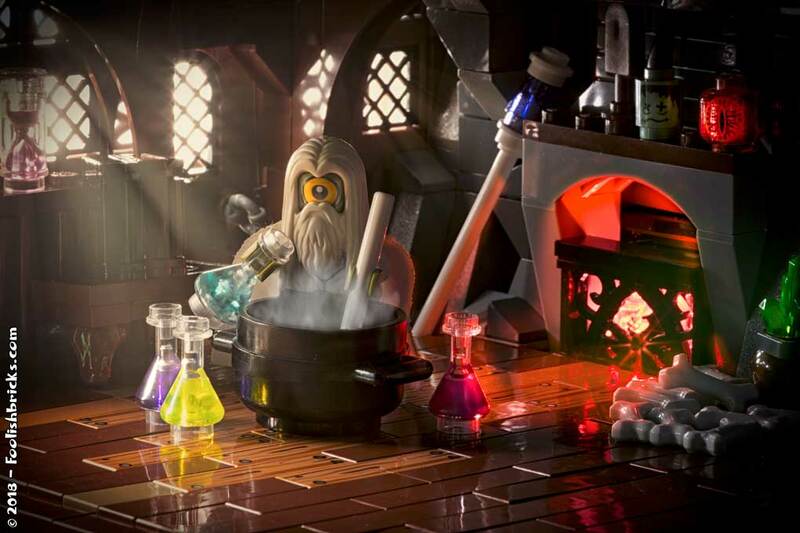 Questions bring theories, theories bring stories, stories make a Lego-photo memorable. Storytelling through Lego-photography is hard, especially because our little plastic friends generally make it more difficult to convey emotions. I hope to have provided you with a few tips and tricks to get the viewers thinking about your image, thus, creating a memorable image. For now, my last two tips on this subject are; be careful naming you image, because a name could guide away the viewer from a story if you’re not careful. And lastly, create technically good photos! People tend to get distracted if there are obvious – non-intentional – technical difficulties with a (Lego-)photo. Now go and practice, because as you know; practice makes better. I look forward to seeing your creations and if you have any more tips and tricks, let me know in the comments. You can also subscribe to Foolish Bricks to receive updates from the surreal Lego world of Foolish Bricks. You gave many tips and points to hold when make own pictures and tell own Lego character’s story’s. You made wonderful and awesome work. Thank You You share with us they different tips and tricks! I’m very glad You got new good motivation…..new adventure in Brickcenter. Now it start coming more great tips.